Our proven manufacturing capabilities are of the highest quality & standards in the market. Our dedicated sales, design & support systems provide a comprehensive network for your enclosure requirements. Our customer focused culture ensures that you & your needs are our 1st priority. management system is certified to ISO9001:2008, ASNZ4801:2001,ISO14001:2004, which recognises excellence in system compliance. This commitment to the highest level of compliance assures you are in good hands doing business with Excalibur. 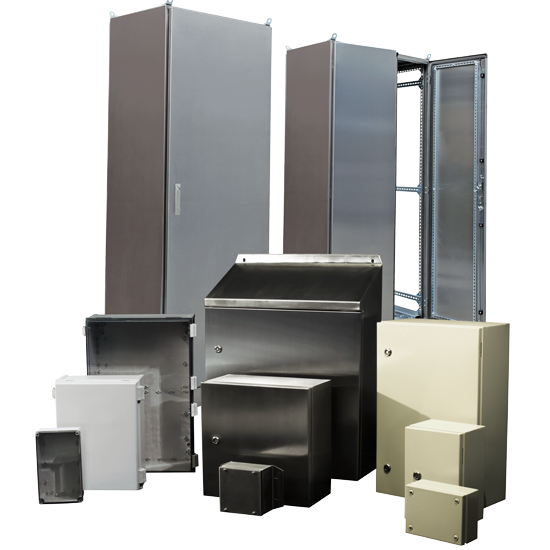 Our unique range of commercial & industrial enclosures stems from our extensive experience working with our clients. Our design base derives from solutions created specifically for your applications. Products like our sloped roof push button station & sloped roof terminal box in stainless steel were created on demand by some of our global partners & have been developed into standard product based on their universal acceptance in the mining fraternity. Our ability to manufacture any conceptual arrangement is a capability we are proud of. We aim to produce to your specifications & promote your involvement throughout the process to ensure absolute satisfaction. From 5 to 500 customised panels, cabinets or enclosures - we are ready to work with you. The Excalibur manufacturing techniques have been honed over many years of refinement. The desire to produce & deliver high quality across the board is an innate characteristic of the business & its people. Quality products, stock accessibility & market awareness are fundamental in achieving our key objective – to add genuine consolidated value & commercial viability to our end markets via our extensive National distribution network. Phoenix Engineering & Manufacturing Solutions announces the acquisition of Excalibur Enclosures as a new subsidiary.